The second season is upon us as all classifications will now officially be in district play this week. Here’s a look at the Kpreps Top 5 for Week 6. In Class 6A, Lawrence remains on top of the poll for a second straight week as the Chesty Lions blast Olathe South, 63-7. Running back J.D. Woods totaled 225 yards on the ground and six touchdowns as the Lions remained unbeaten. Defending champion Shawnee Mission East remains at No. 2 this week after the Lancers rush for more than 500 yards in a win over Leavenworth. Wichita Northwest is ranked third this week, while Derby is up one spot to No. 4. On Saturday, the Grizzlies finished off Wichita South 47-34 after the game was postponed from Thursday night due to weather. Derby picked up a big 62-30 road win at Salina South behind a big rushing night from senior quarterback Brady Rust. Finally, Shawnee Mission West enters the poll at No. 5 this week. The Vikings improved to 5-1 with a 42-14 win over Olathe East. 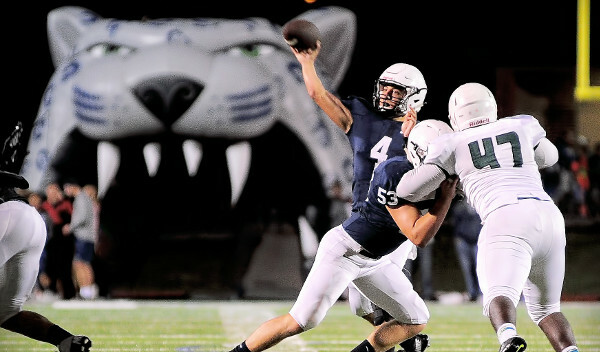 There are no changes in this week’s Class 5A poll as all five teams posted impressive wins. The big matchup last week featured No. 3 St. Thomas Aquinas at Blue Valley. The Saints trailed 13-7 at halftime, but dominated the second half in pulling away for a 35-13 win that knocked Blue Valley out of the 6A poll. Key games this week include No. 5 St. James Academy hosting No. 1 Mill Valley to begin district play. The Thunder and Jaguars will join the Eastern Kansas League together next fall. Also, No. 4 Pittsburg travels to take on Blue Valley West (2-4) in District 4. Blue Valley West’s four losses have come to top-ranked teams in Lawrence (6A) and Bishop Miege (4A-I), Blue Valley which was ranked in Class 6A the first six weeks of the season, and a Blue Valley North team that is 5-1. The top three remain unchanged in Class 4A-I this week, but there was some change in the bottom two spots in the poll. Andover Central moves up one spot this week to No. 4 after a 44-34 shootout victory over Haysville Campus, while Fort Scott enters the poll after beating Independence 31-14. The Tigers replace the Ulysses Tigers in the top five after Ulysses was shut out 35-0 at home by Scott City. This week’s schedule features No. 3 Topeka Hayden traveling to No. 4 Andover Central to open district play. In Class 4A-II, top-ranked Columbus got quite a scare at St. Mary’s Colgan on Thursday night. The Titans remained unbeaten by scoring twice in the game’s final six minutes to win 43-40. The remainder of the also remains unchanged this week. Andale remains at No. 2 after a hard-fought win over Mulvane, while Holcomb had little trouble with Lakin. Osawatomie, ranked fourth, cruised past Central Heights, and Royal Valley remains at No. 5 after a 20-12 road-win at Sabetha. The Class 3A top five poll remains unchanged this week, but we need to highlight No. 3 Scott City’s performance against Ulysses. The Beavers shut out the then 4A-I No. 4 Tigers 35-0 by holding Ulysses running back Ian Rudzik to 29 yards rushing on 15 attempts. Elsewhere, No. 5 Silver Lake trailed 14-6 at halftime against Rock Creek, but the Eagles scored 35 points in the second half to win 41-14. In Class 2-1A, No. 2 Sedgwick fell behind 24-0 in the first half only to rally and beat No. 4 Phillipsburg, 34-32. The Cardinals trailed 24-7 at halftime, but were able to overtake the Panthers early in the fourth quarter and hold on for the big road win. Elsewhere, No. 1 Meade and No. 3 Smith Center posted shut out wins, while Troy enters the rankings at No. 5 this week. The Trojans replace previous No. 5 Marion which fell 34-24 to Northern Heights. The 8M-I top five also remains the same this week. The top four teams rolled to big district wins with the closest margin of victory being 46 points. Fifth-ranked Burlingame picked up an impressive road win in District 3 by beating Rural Vista, 48-26. The Bearcats led 22-6 at halftime and extended that lead to 28 points on two occasions in the second half. Finally, Victoria remained unbeaten in 8M-II with an impressive 52-6 district win over Beloit St. John’s-Tipton. Second-ranked Sharon Springs-Wallace County and third-ranked Argonia-Attica easily cruised to district wins this week as well. Otis-Bison stepped outside of district play to shut out Fairfield-Cunningham, 52-0. Pike Valley enters the poll this week at No. 5 after the Panthers outscored Frankfort 24-0 in the fourth quarter to win 74-50. Lane Peters rushed 35 times for 428 yards and seven touchdowns for Pike Valley in that win. The Panthers replace Pretty Prairie in the No. 5 spot after the Bulldogs were upset by Caldwell, 48-24.